Goa Chief Minister Manohar Parrikar died on Sunday evening at his son’s home in Panaji, Goa. He died at the age of 63 after battling with a pancreatic ailment. The technocrat-turned politician was known for his simplicity and for his dedication towards his work. Even after fighting with his disease, he never off to his duty and was a real fighter, who never let his work suffered because of his deadly disease. It was the love and dedication of Parikar that made him the chief minister of Goa for four times. 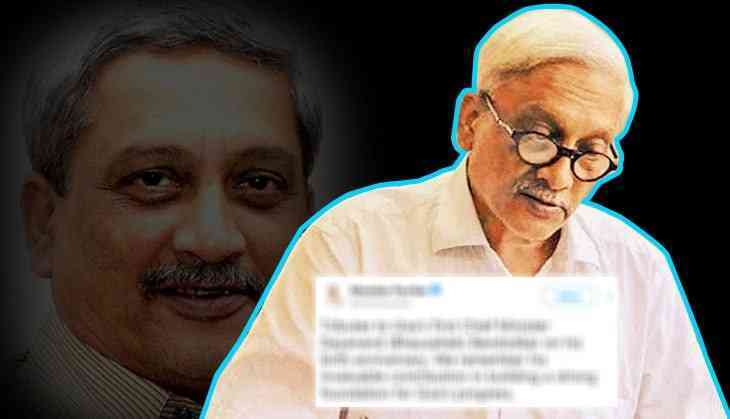 Goa Chief Minister Manohar Parrikar was also active on social media and kept on updating about his work and contributions for his state and country. He had tweeted for the last time on the micro-blogging site on 11th March 2019. In his tweet, he had paid tribute to Goa’s first chief minister Dayanand Bandodkar on his birth anniversary on 11th March. Meanwhile, the whole nation mourning over the demise of Manohar Parrikar and expressed their grief on the social media. From PM Modi to Rahul Gandhi, all other politicians and netizens have extended their condolences on Twitter.